Deutz Decom dealership diagnostic equipment is designed to fully service all DEUTZ machines from small diesel engines and ends with mining equipment. 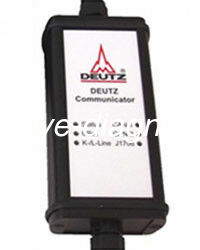 DEUTZ DIAGNOSTIC KIT (CANUSB) allows you to access the entire electronic control module (ECMS). DEUTZ DIAGNOSTIC KIT control programs Deutz SerDia 2010 (2015) allows you to change not only the operating modes of the engine or group, but also to customize the ECM or update the firmware of the electronic control module. ON Deutz SerDia 2010 (2015) has a clear interface and is easy to use.